Tech has some hidden advantages, like the relatively low cost of compensation compared to other industries. And it's multiples are actually reasonable on a historic basis, compared to the valuations of companies and industries in previously frothy markets. Even with all the cash being splurged on developing self-driving cars, smart cities, chess-conquering AI and wood staining wireless speakers, the greenbacks are erupting out of the Valley's finest. Tech companies have a secret weapon to offset capital expenditure: equity compensation: paying employees in stock is a non-cash expense which is added to profits when operating cash flow is toted up. (And) how does this tech market stack up compared to other eras of investor joy? On a valuation basis, extremely well. Over the past five or so years, you may have read we are in the midst of another tech bubble. Crystal ball surrogates like Forbes, Motley Fool, CNBC and erm, the Financial Times have at some point thrown the popular market-top term around, only to see the technology leviathans shoot higher on the promise of unbridled earnings growth and addressable markets limited to the world's total GDP. So are the valuations of technology darlings another example of frothy investor sentiment getting ahead of fundamentals? 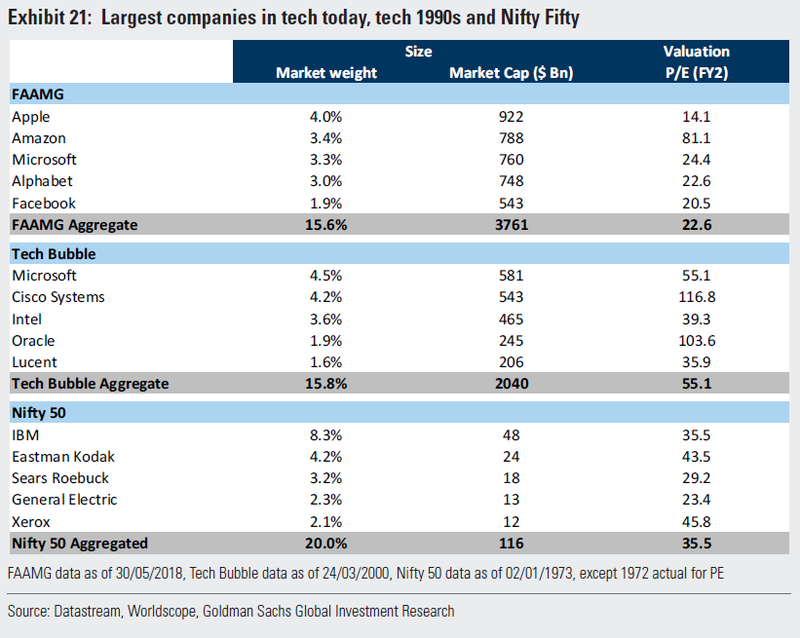 Well, not according to Goldman Sachs, who despite warning of a “valuation air-pocket” in US technology last June, released a note titled “why tech is not a bubble”. We cannot argue with the superlative margins of the tech giants, thanks in part to the accounting quirk which means capital investment in, for instance, cloud infrastructure is not run through the profit and loss statement. So even with all the cash being splurged on developing self-driving cars, smart cities, chess-conquering AI and wood staining wireless speakers, the greenbacks are erupting out of the Valley's finest. However, as we've written about before at Alphaville, the tech companies have a secret weapon to offset capital expenditure: equity compensation. In short, paying employees in stock is a non-cash expense which is added to profits when operating cash flow is toted up. Indeed taking the last financial year as an example, equity compensation at Facebook - $3.7bn - took more than half the sting out of the $6.7bn that the social network spent on capital expenditures. Sure, the free cash flow yield for the tech companies is high, but the waltz between equity returns and employee retention only has to miss a few beats for free cash flow to stumble lower. And what about regulatory scrutiny? After all, it's just over two weeks since Lord Zuck was hauled in front the European Parliament over the on-going Facebook data scandal. Oh, and don't forget Apple's €13bn fine from the European Commission for its tax practices or Google's $2.4bn penalty, from the Europeans again, for distorting its search results in its own favour. Readers may be surprised that Goldman are unperturbed by the regulatory guillotine hanging over big tech. But then, the bank has experience in the hot seat, in 2016 agreeing a civil settlement of $5bn with prosecutors over mis-sold mortgage backed securities, for instance. Also history has shown that dominant companies in the past that have faced regulation can still remain very successful for long periods of time. Standard Oil, for example, controlled over 90 per cent of oil production in the US by 1900 and 85 per cent of sales. Its dominant position finally resulted in the Shermon Antitrust Act to break it up in to 34 separate companies in 1911 (some of these became Exxon, Mobile, Chevron and Amoco). But by 1917, despite the breakup of Standard Oil, one of its parts - Standard Oil of [New Jersey] - was still the third biggest company. Maybe a business like Google, with its YouTube, cloud and self-driving units, would be even more valuable split up, but would Amazon's retail arm command the same valuation without Web Services propping up the group's bottom line? Break-ups are not the only option though. Up to the antitrust action of 1982, AT&T spent a good seventy years in a Faustain bargain as a quasi-government monopoly: free to be the sole provider of telephone services across US but forbidden from competing in nascent technology markets. As told by economist Bill Janeway, AT&T's famous Bell Labs research and development was therefore forced to licence proprietary technology, such as the UNIX operating system that underpinned 1970s computing, to American firms rather than utilising the software to increase its competitive advantage. If a similar legislation was to be enacted on say Google, we think it's safe to say that investors would not be best pleased to see its valuable AI and self-driving algorithms released, by regulatory pressure, into the commercial wild. After you finish gawping at those figures for the NASDAQ bubble of '99 (Cisco at 117 times earnings), it's clear, bar profit-suppression specialist Amazon, this cohort of tech behemoths are relatively well priced. Apple, for instance, despite its near one trillion dollar market capitalisation, trades at 14 times expected earnings. So while stock-market concentration may not be a problem, if the economic spoils continue to accrue to the fraction of businesses that, as the OECD describes, “capture most, or all, of the market”, we would not be surprised to see politicians knocking at the door, torches and pitchforks in hand. Goldman is right that, in terms of valuation, US (and global) technology has never been in a better place, with a few notable exceptions. The real question is though, will the regulatory axe fall outside of Europe, if at all? Perhaps there is reason why tech seems so cheap at the moment.